Pearson Select is a collection of a variety of arm, back pillow and leg styles all based on a deep, 24" seat, that can be configured into a myriad of possibilities. You select the design options and create your own personal chair, sofa or sectional design. Included below are photographs of details to select from, line drawings of plan views, and an ordering guide to make creating your own piece simple. Four simple steps, it's truly that simple. 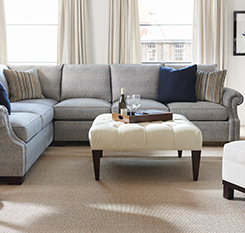 To begin designing your custom Pearson Select upholstery, use the options below. Click the thumbnails to enlarge images and add your Tear Sheet. When finished, select the Tear Sheet tab to view or print your selections.